Revolving doors are energy efficient, preventing drafts. They are also efficient from a traffic standpoint, allowing large numbers of people to enter the building. Do revolving doors move clockwise or counter-clockwise? Why? In this building, there are 4 compartments in the revolving doors. What fraction of a complete turn do the revolving doors make for 1 person to enter the building? For 2 people? For 3 people? How many degrees (out of 360°) do the revolving doors rotate when 1 person enters the building? 2 people? 4 people? 8 people? 100 people? These doors make 4 complete rotations in a minute. Assuming one person in each compartment, what is the maximum number of people that can enter the building through these doors in 30 minutes? In 60 minutes? How long would it take 100 people to go into or out of the building if all compartments were full? How would changing the design of the doors to 3 compartments or 5 compartments affect the size of the compartments? Affect the flow rate through the doors? 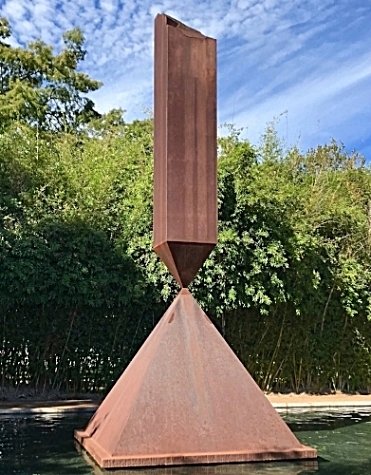 The Broken Obelisk, a sculpture designed by Barnett Newman, is set in a reflecting pool on the grounds of the Rothko Chapel near the building that houses the Menil Collection in downtown Houston. This sculpture represents the Rothko Chapel’s “commitment to human rights and social justice” in honor of Dr. Martin Luther King, Jr. “a great man whose life and ministry embodies the values of this sacred institution.” Incarceration rates, police killings of minority populations, poverty levels, living wages, homelessness, health insurance rates, housing affordability, graduation rates, and race and ethnicity equity/disparity are among the pressing social justice issues facing and weakening our beloved country. Using 2010 U.S. Census Bureau data, assess the state of social justice in Texas. Use basic statistical measures of central tendency and dispersion, compare Texas to some of the strongest states in terms of social justice and equity, like Vermont, and Massachusetts, and to some of the weakest states including Louisiana and Mississippi. Compare individual measures, like those suggested above, or create your own index of social justice. Walking down the street provides myriad opportunities for engaging math connections for even the youngest learners. Consider skip counting. Skip counting reveals patterns in numbers, lays the foundation for understanding multiplication and it’s fun! Examine the pavement below. Each brick has eight raised circles. Counting by eights, how many circles are there? Jim Love, Jack, 1971. Steel and Paint. Jacks, originally known as “knucklebones” (named for a game that used the bone in the ankle of sheep), is a game of ancient origin. This playful sculpture of the modern toy conjures up a variety of mathematical observations. At about 10 feet tall, what is the scale factor? What diameter ball would be appropriately scaled to this sculpture? What height person would be appropriately scaled to this sculpture? How many right angles are contained in the sculpture? How many angles of rotation are there? About how much does the sculpture weigh (one cubic inch of steel is about 0.28 pounds)? Art museums present outstanding opportunities for math connections for students of all ages. "The visual arts should be used to make mathematics visible to the body's eye, not to keep it confined to the mind's eye as they usually are," Piergiorgio Odifreddi, Professor of Mathematical Logics at the University of Turin. 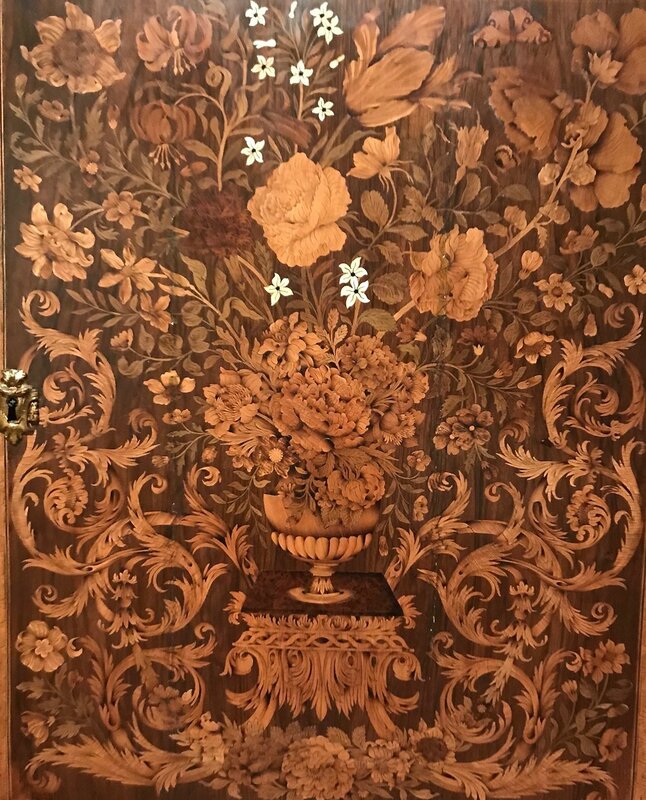 Recognizing mathematical properties in a work of art enhances the appreciation of the art object, regardless of whether the artist intended to incorporate mathematical ideas into his or her work. Connections between mathematics and art are ubiquitous and the intricacies of art can be understood and described using mathematical concepts. The following examples from the Cooper Hewitt, Smithsonian Design Museum in NYC, provide a glimpse of the types of mathematical questions to discuss with your students to enrich their appreciation of art and reinforce their understanding of math. 1. Cabinet on Stand, 1665-1700, England. There are many repetitive patterns and types of symmetry applied in this design. Identify them. Explain why the patterns and symmetry, project a strong sense of harmony, despite the complexity of the design. 2. Platter, 1888-98, William Fend De Morgan, England. Although the shapes differ, there is still symmetry in the design. 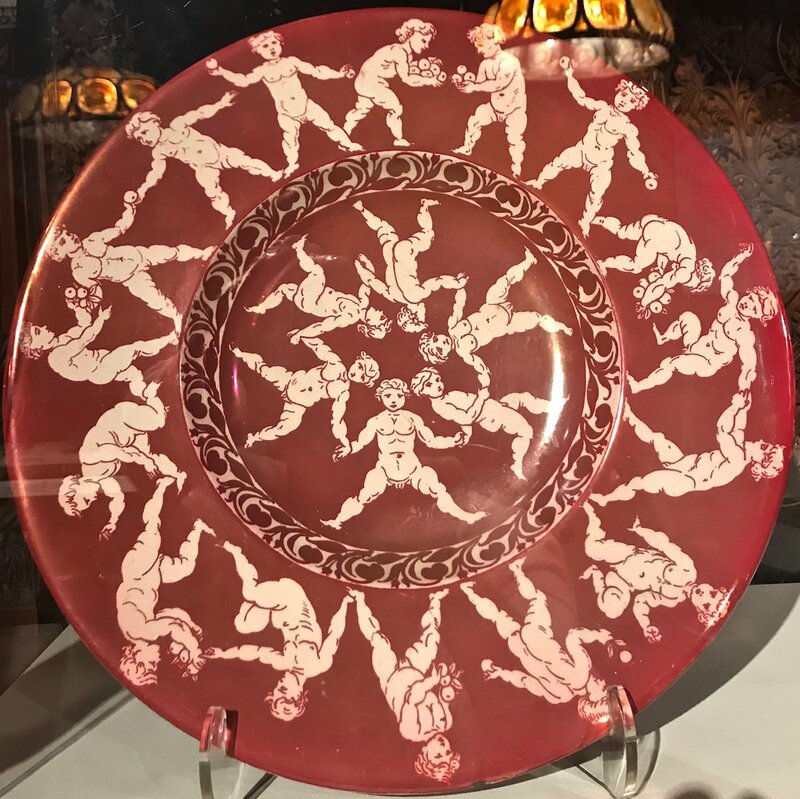 What is the name of the polygon formed by the 16 figures on the outer edge of the plate? What are the total degrees of the internal angles of this polygon? What is the name of the polygon formed by the inner 6 figures? What are the total degrees of the internal angles of this polygon? Using this information, derive the formula for the interior angle sum for any convex polygon. 3. Tazza, ca. 1720, manufactured by Clerissy Factory, France. What types of symmetry are evident in this design? How many times is the design on the edge of the plate rotated, without changing the object, in a full circle? What is the angle of rotation? Describe how the symmetry and angle of rotation changes from the outer edge towards the center of the well. 4. Poster, Stephen Frykholm, ca. 1978. 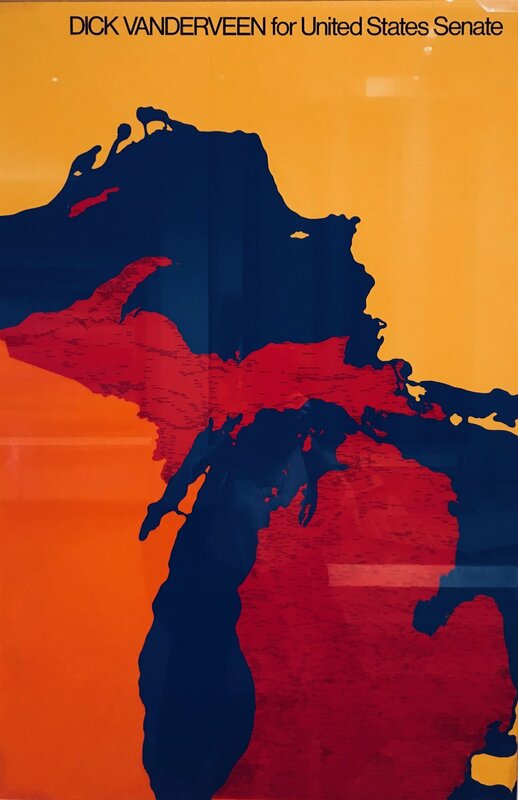 In math, the four color map theorem states that no more than four colors are needed on a map so that no two adjacent regions have the same color. Using the following poster, explain why. 5. 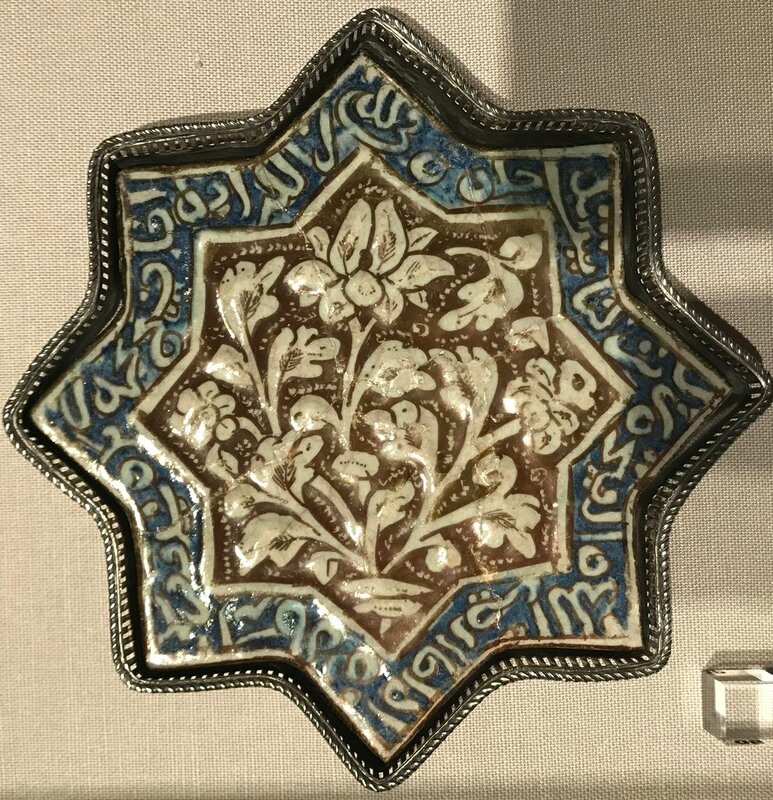 Tile (Iran) 1301-50. The geometric designs and calligraphy of Islamic art include many elements of symmetry, including combinations of repeated shapes that may have been overlapped or interlaced. Describe the tile in this geometric context. Zaha Hadid studied math before turning to architecture. It is apparent in the geometrical forms that dominate Zaha Hadid’s architectural style. Her curvilinear geometric motifs and use of both Euclidean and non-Euclidean geometry are evident in the 28th Street condominium that she designed on the High Line in NYC, creating a strong sense of motion and fluid space. Observe the various types of symmetry evident in the design; note the strong horizontal parallel curves; the interplay between concavity and convexity of these curves; the contrast between circular and elliptical forms that comprise the facades; and how these shapes change as the perspective of the viewer change. Truly a brilliant math lesson for the budding geometers who visit the High Line. On 23rd Street in Manhattan, there is a wonderful new sculpture, courtesy of Sodastream, in partnership with the Oceanic Society. Entitled, Drowning Liberty, it measures roughly 8ft, by 16 ft by 8 feet, and is packed with 12 ounce cans and one-liter bottles. How would you estimate, calculate or model the number of containers in the prism? The Vessel at Hudson Yards is ripe for mathematical investigation. With 154 interconnecting flights of stairs, 2,500 steps, 80 landings and a mile’s worth of pathway, questions abound. How many people do you estimate could climb the Vessel at the same time? What is the slope of the staircases? At 600 tons in weight, and a base of 50 ft widening to a peak of 150 feet in diameter, what is the approximate weight of each level? Explain the tessellation of shapes you observe in the structure. Name the different types of symmetry evidenced in the structure. How many hexagons are formed by the structure? Classify and describe the sculpture using its geometric properties; e.g. interior angle measures, perpendicular/parallel sides, congruent angles/sides and compare them to the geometric properties of MC Escher’s impossible constructions and the famous stepwell of Chand Baori.